Ready to usher in 2018? Make your way to these hotels and brace yourselves for epic countdown parties and, you've guessed it, fireworks shows! Having fireworks on New Year is like getting a cake for your first birthday. It’s THAT important. Anywhere in the world, a good fireworks display is a sign of what amazing year we can all look forward to. It celebrates both the end and the beginning of a new chapter in our lives that it’s simply a must that we take part in only the grandest of them all. Good for us Filipinos, there are several places in the country, including hotels, where we can watch them as they light up the midnight sky on those first seconds of 2018. Here are some of them! 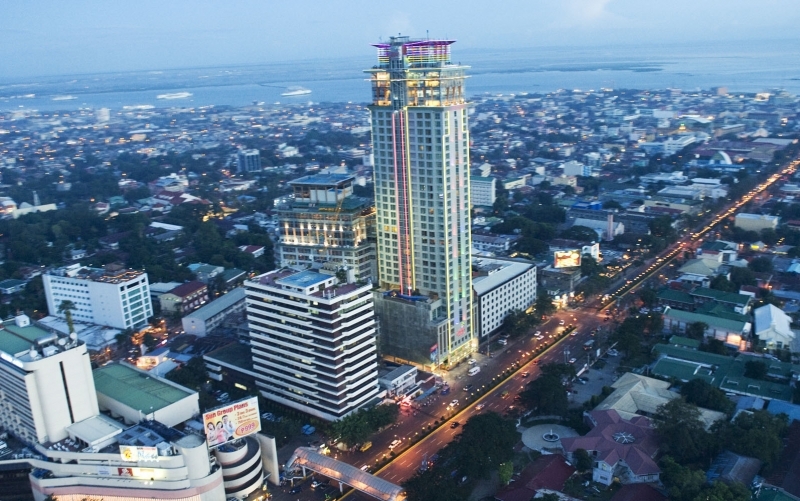 Okada Manila is the latest addition to the opulent integrated resorts of Manila’s Entertainment City. More than the amazing entertainment, dining and accommodation options, the 44-hectare casino and hotel complex got people’s attention due to its cutting edge and highly Instagrammable designs. With those in the table, the most stylish New Year welcoming extravaganza is at hand. Live entertainment, including performances by renowned DJs and bands and a special projection mapping show at the Crystal Corridor, are only the beginning, as guests will be treated to the most stylish fireworks show from Okada’s premier shopping strip overlooking its iconic fountain. 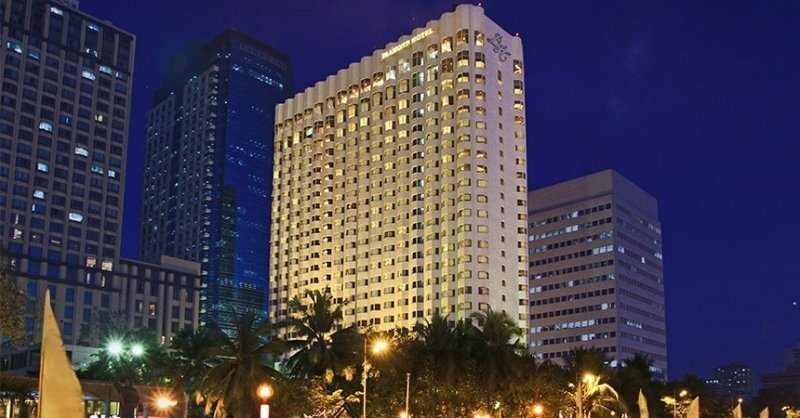 Located in the heart of Manila, Diamond Hotel provides an ideal venue to celebrate New Year. And not just because of the buffet at Corniche, the cocktails and barbecue at the Poolside Bar, a live performance by Maria’s Project or even the fact that you get a chance to win round-trip tickets for two to Davao. At the top of it all is the biggest fireworks viewing opportunity happening at the Manila Bay that rivals even the infamous sunset panorama the hotel is known for. During the New Year celebration, it’s easy for people to gravitate towards the busier districts of the city so they can easily pick up on everyone else’s energy. But that doesn’t mean that choosing to go somewhere as far away from the centre as like Alabang is any less exciting. If you’re up to it, Acacia Hotel Manila is opening its doors for you with a New Year package that comes with a ticket to its countdown party at Sequoia Ballroom, where you can witness a balloon drop and a 180-degree view of fireworks! 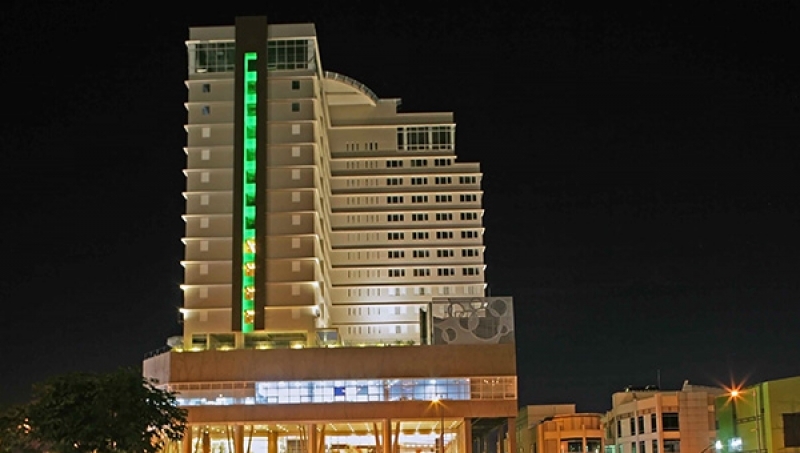 When you have the chance to stay at your city’s tallest building, you know you can expect nothing less than a remarkable view of the fireworks around, and it’s exactly the kind of experience you will have at Crown Regency Hotel & Towers Cebu . Don’t worry about not getting your VIP spot because the hotel is offering a few special offers for both adults and kids that give you a complimentary access to a fireworks show, alongside getting a free sky ride and an international dinner buffet at Sparkz Restobar. Whoever said watching fireworks is a city thing? 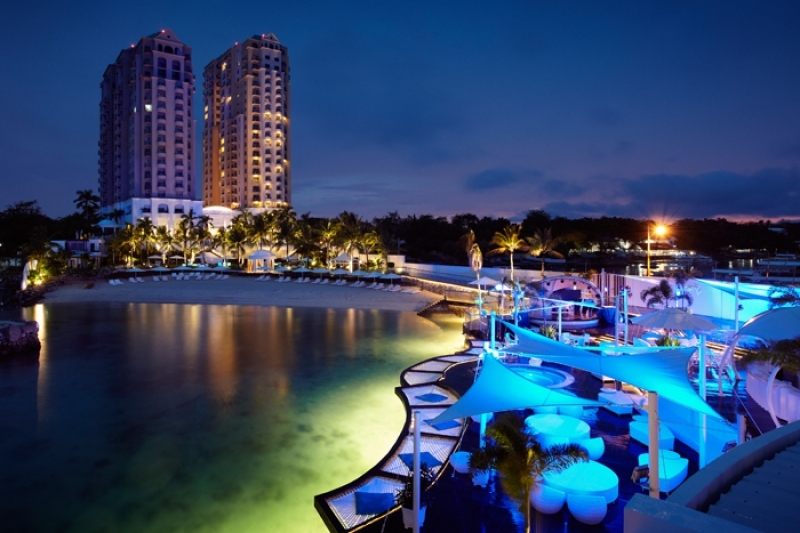 Mövenpick Hotel Mactan Island Cebu , that gorgeous Mediterranean-inspired beachfront resort located southeast of the province, attempts to combat the idea by offering a rare chance to view these magnificent pyrotechnic creations at a beachside setting. Enjoy free-flowing drinks and a performance by the Ibiza Show Team while you take in that splendid view! Boracay is just about every party-lover’s paradise in the Philippines. The vibrant nightlife, mouth-watering food and picture-perfect beach spots are especially worth it when a big event like ushering in the New Year comes about. This is why going to the right section of the island, a.k.a. White Beach in Station 1, is crucial. Here, you will find Discovery Shores Boracay and its after-dinner party on the 31st, which lets you enjoy the superb fireworks display by the water. New Year in paradise? Yes, please! Club Paradise Palawan may look like a quiet, secluded place for something as ornate as a New Year celebration, but it’s also why spending it here is extra exciting. As it happens, the exclusive island resort is coming up with its own gig on the last night of the year where you will welcome the New Year with a banquet, DJ Dodi Nacino, Eufouria Band and an enchanting fireworks display all while in your futuristic attires. When it comes to this season’s celebrations, Filipinos are, in fact, tough ones to beat. While we enjoy the dazzling colours and configurations of these fireworks shows, wherever we may be in the country, we cannot ignore the true meaning they serve us in this key time of the year. Once and for all, let go of your negativities and face 2018 with nothing but positive vibes! 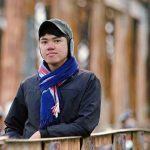 For more amazing getaway destinations in the Philippines, check out TripZillaSTAYS !